It was 1892 when a group of revolutionaries in Manila founded a society composed of anti-Spanish Filipinos. The names of Andres Bonifacio, Ladislao Diwa and Teodoro Plata are remembered as the roots upon which the secret organization grew from. From the root word “tipon” which could be translated to mean “to gather together” or “a society or gathering of people”, the secret militant society named itself “Kataas-taasang, kagalang-galangang Katipunan ng mga Anak ng Bayan” (which translated to “Supreme and Venerable Society of the Children of the Nation”). It was only a matter of time that the organization became known by its red banner with the eight-rayed sun and the acronym K.K.K. The Katipunan sought to achieve three main goals; to unite the Filipinos into a solid nation, to achieve independence by means of a revolution, and to establish a republic after independence was achieved. Its members were known as Katipuneros. Julie and Ricardo were sitting a few feet from the old man, who animatedly told them what he knew of the Katipunan. The man spoke with passion, describing the symbols and iconography which the organization embraced to signal hidden codes or messages to one another. He spoke of their valiant sacrifices, their brave endeavors and their intensive deliberations on how to liberate the country from the hands of its Spanish conquerors. Julie found the old man amusing. While he did raise a degree of alarm, Julie could not help but see how much being able to talk about the Katipunan supercharged Nonito with so much excitement and fervor. He would motion with his hands, describing things with accompanying gestures in hopes of communicating his ideas better. He would struggle with Spanish and attempt to explain that the translation “more or less sounded like that.” Julie realized the old man reminded her of her Tito Jal. A good friend of her father, Tito Jal stuck around and visited Julie and her mother in the many years following his death. He was there that night Julie frightened everyone when she brought out her father’s gun. He was also with her father that night Captain Santos was gunned down by militant insurgents somewhere while on a mission in Mindanao. Tito Jal also talked much with his hands and even loved to include his best attempt at recreating the sound effects with his narrative. Julie realized she was not sure if her Tito Jal made it through the earlier nights of the zombie invasion alive. Ricardo found the old man disturbing. While he was slightly amused by his antics, all Ricardo could think of was how in every single zombie movie that was ever produced, there was always at least one character who was known to be the one who “goes mad, kills some of the people in the cast, and eventually gets his comeuppance in the hands of the hungry dead themselves.” Each time Nonito would swing his arms around, Ricardo would imagine zombies tearing through the glass windows and dragging the old man away to be eaten. Ricardo could barely pull his eyes away from the sledgehammer that hung on the old man’s belt. He was strong. He was definitely strong enough at least to lug that thing around. But even with that much strength, the fact there were two sleeping bags, baby things, and no signs of either a second person or a child nearby made Ricardo seriously question if this old man had something to do with their disappearance. For all he knew, a couple was hiding here with their child before he came along and forced them away. Or worse. Nonito paused for a moment, as if remembering some bitter memory. He clenched his fist and suddenly slammed it against his chest. Once. Twice. Then he coughed aloud and cleared his throat. Ricardo offered him a swag from the bottle he had. He declined. 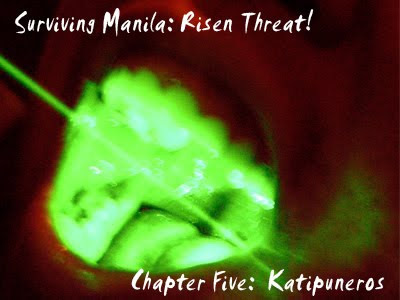 “And these Katipuneros, they are the things we call zombies,” Julie asked, trying not to sound too forward or brash. Nonito clearly had something against wives, and even if Julie was merely posing as Ricardo’s wife, she knew better than to test the limits of his patience. Nonito began to scoop the now piping hot Arroz Caldo into the makeshift bowls that were nearby. Julie was tempted to ask for her bowl and wipe it clean first, but decided not to agitate the old man further. Julie tried to eat. The Arroz caldo was still steaming and it had been quite some time since she ate anything which was recently cooked. Dining on cookies and peanuts could only go on for so long. She scooped a spoonful into her mouth, tasted the rich harmony of garlic, starchy rice and the slight tinge of chicken, but found herself unable to truly indulge. The tension in the pit of her stomach was rising to her throat. Her instincts were warning her to stay ready, and staying ready meant energy pooled in her legs and arms. Digestion would have to wait. Ricardo threw Julie a nervous glance. Julie glanced downwards to her waist and back at Ricardo. He knew she was hinting at her gun and turned to look to the left then right then back at Nonito. Julie waited for Ricardo to glance his way again. The old man’s sudden rant caught them both off guard. Ricardo nearly spilled his rice meal over his legs. Julie subtly pulled her hand back from the holster’s safety. She had reflexively reached for her gun. Ricardo saw Nonito looking at him and realized the old man was checking if he was paying attention. He made a visible show of nodding and echoed his last few words. “We were wrong.” Ricardo felt his right hand beginning to shake. He saw the congee quivering in the bowl and knew his fear was besting his composure. He set the bowl down before it gave his emotions away. Ricardo found himself finding a momentary solace in his thoughts. Faced with the prospect of revealing the growing fear inside of him, he drew strength from his creativity. He found himself focusing on the bowl set on the ground and the hilarity of dying because of what a bowl had revealed. And it was not even some arcane secret or some political conspiracy. It was just the fact that he was terribly frightened of the man who had given him food. Maybe, had his death been a result of protecting such secrets, he would feel it was one more heroic. Ricardo felt a brief smile emerge when the thought came to him. Julie would die a heroic death. Unlike him, she would die one befitting that of a hero. She had secrets to keep. She was aware of things Ricardo could only ponder over. Like why she was such a good shot with her gun. Or how she seemed to know the man named KaQoH in Shaw station, or how to intimidate him to get them through. Was she actually someone from the military? A foreigner? Some undercover agent infiltrating the nation during this crisis? Or maybe even the one behind all this, assuming the zombies were brought back to their hungry unlife by some strange chemical pseudo-scientific agent. Ricardo felt the smile waver. It was meant to be an exercise of creativity to break away the fear. Instead, it had made him realize questions he had overlooked. Ricardo left Nonito’s hand clamp down on his shoulder. He looked up to see the old man staring at him, as if to see if he understood. He quickly nodded to show he did, even if the last few seconds on introspection kept him for noticing what he had been ranting about. Ricardo quickly ran his thoughts on the options he had. Talking to Nonito and telling them they had to go ahead seemed unlikely. Somehow, Ricardo sensed Nonito would turn possessive of him. Or maybe of her. Ricardo was certain the old man would not let them both just simply go. He knew Julie wanted him to distract the old man. To give Julie enough time to use her pistol. Ricardo did not feel the man needed to die, however. He felt a more amicable option still existed. Ricardo realized the answer was staring at him all this time. He raised the bowl to his mouth, then stared at Julie until she noticed him. He then slowly scooped some rice into his mouth. His hand lingered in front of him. He pulled the bowl and hand away then feigned a moment where he felt the urge to vomit. The old man was lighting himself another cigarette. The smoke circled around them, hanging in the still air. She understood. She brought her own bowl up and waited for Nonito to glance towards Ricardo. Rather than risk drawing a weapon, firing it at this close a range, and hitting Ricardo, she drew in two mouthfuls of the congee. She held them in her mouth and waited for the opportunity to enact the plan. Or at least, what she thought was the plan. Nonito raised both hands upwards, like a man talking to a crowd. Ricardo gave Julie the signal. Julie gave a loud belching sound. She sprayed out part of the congee in her mouth onto the nearest wall and immediately began to feign a degree of sickness. Ricardo thanked God that Julie noticed his cue and quickly got up to his feet. He motioned apologetically towards Nonito, slid past him, and made his way towards her. Nonito turned his gaze towards Julie and eyed her suspiciously. Nonito brought his hands down. The cigarette continued to burn a steady trail of smoke upwards. A half-inch branch of ash hung precariously on the cigarette. But like a testament to Nonito’s stoic gaze, the ash did not break away and fall. They remained unmoving just like the man who smoked it. “Hope you don’t mind if we step out for a bit,” Ricardo faked being embarrassed and grinned. He took her arm and helped her to her feet. “She can grab air on her own,” Nonito suggested. Ricardo was now even more certain that this man was crazy. No man in his right mind would ask a woman who felt sick to step outside into zombie infested streets on her own. Even while in the safety of the MRT line. The old man was definitely desperate for company. This made him even more dangerous. Nonito shook his head. He placed his own bowl down at the floor and calmly reached for the sledgehammer strapped to his belt. Julie noticed his slow deliberate movement and decided the jig was up. She moved quickly, drawing her pistol from the holster and extended it towards Nonito. Ricardo froze as the extended arm and gun rested against the side of his head. “Don’t,” she told Nonito, her gaze like daggers, pinning him in place. Nonito met her gaze with his in an unexpected staredown. “Don’t what?” he told her and freed the sledgehammer. It dropped to the ground with an awful thud, rattling the nearby bowls against each other. Ricardo risked a quick peek and saw Nonito heaving his mighty arms to lift the hammer to his shoulder. He moved forward, ducking under Julie’s arm and turned to stand alongside her. He drew the shotgun out and took aim as well. “I love the Philippines, the land of my birth,” Nonito declared, first shoving his right meaty fist against the center of his chest, then raising his arm perpendicular to his body, elbow onwards upwards with the fist opened into a hand. He left the sledge hammer on the ground, much to Ricardo’s surprise. “We are leaving. We will be heading out that way,” Ricardo told the old man as he and Julie began to inch their way backwards towards the next train segment. “The home of my people, it protects me and helps me!” Nonito continued to say, not moving from where he stood. “We don’t want any trouble,” Ricardo continued to explain as they backed away. Julie kept her pistol trained at Nonito’s head. She pursed her right eye slightly closed, slowing her breathing to maintain her aim. “Ricardo,” Ricardo still corrected her. “To become strong, hardworking and honorable,” Nonito continued to declare, his gaze never breaking away from Julie’s. The staredown continued. “Maybe you should. I got a shotgun. The old guy is pretty big,” Ricardo suggested. “Because I love the Philippines, I will heed the counsel of my parents,” Nonito declared, his voice rising in volume. Ricardo pulled the shotgun back and ran, navigating the route until he saw the last train segment. The light bulb here illuminated the whole section. It showed the route was clear. The glass front of the segment had been shattered. The debris had been dug away to create a crawlspace into the next set of train segments. Cursing himself for having to do this, he ducked down and peered through. It was dark. The system of wires and bulbs did not extend to the next segment. He quickly dropped down to his knees, glanced back to check that the old man wasn’t there with Julie slung over his shoulder, and drew out his trusty pair of scissors and the lapad of gin. He sprinkled some gin onto his hand, wiped it against one length of blade, then tuckled the lapad back into his pocket. He then took out his lighter, and lit the moistened portion. Holding the make-shift torch carefully, he then returned to the crawl space and threw the scissors inside. The metal clattered into the train and the fire illuminated the immediate surroundings. Julie just heard Nonito declare that he will obey the rules of the school and perform the duties of a patriotic citizen. She hated having to agree to Ricardo’s request not to kill him, but she knew that if she just killed the old man, she would lose the trust they already had. Trust was too precious a commodity now, and Julie inwardly admitted she did appreciate the change his company had added. It was nice to be able to talk to someone while avoiding the mindless hordes. Even better to have that someone be a person with a sense of humor. She took a few more steps back. Julie stopped. The old man sounded sincere, even in this madness he was talking about. A banging sound clattered from the Shaw side. “I’ll do the dishes,” Nonito grinned, then grabbed the sledge hammer and began walking towards the sound. Ricardo could not see anyone else in the other train. Save for the still burning pair of scissors on the floor, the only other sources of light were the breaks in the train’s ceiling and windows where the debris was light enough for moonlight to shine through, and the end of the segment which was outside the rubble that was once Boni station. Looking ahead, Ricardo could see the tracks of the line and was thankful the moon seemed full enough to illuminate them. With a silent prayer, he slid the Armalite into the crawlspace and followed after. He landed into the flickering light of the burning scissors. Quickly, he took the serrated knife, clipped a piece of the scarf, then tied it on the knife’s edge. He soaked the knife in some gin, and lit the makeshift torch on the dying flames of the scissors. The torch burned bright just as the scissors consumed all remaining fuel on it. Scanning around a second time, he hoped to find something else to use as fuel in this area. The closest possible thing was a piece of cloth that he saw lying at the floor near the eastern door. Still in his kneeling position, Ricardo brought the Armalite back up. He slinged the rifle back on and then reached for the scissors on the ground. Still hot from the fire, Ricardo yelped out in pain from the heat and dropped them back onto the floor. Raising the makeshift torch a bit higher, Ricardo tried to see if the movement was just a trick of the flickering flame. The cloth moved again, clearly disturbed by something that lay underneath it. *I don’t like this! * Ricardo tried to shake off the tension but knew what most likely was under that sheet. It did not take a genius to consider what may have happened now, seeing the cloth, that lead to old man Nonito becoming as unhinged as he was. Ricardo knew underneath the cloth was the child. And he knew the child, once Nonito’s grandson perhaps, if not his own baby, was now one of the undead. Reaching down tentatively, Ricardo patted the scissors to check if it had cooled down enough. Feeling the now slightly warm metal, he scooped the scissors up and slid them back into place in his pocket. He then slid his finger back around the grip of the Armalite and fingered for the trigger. There was a sound unlike that of a giggling burbling child. And it was that moment that Ricardo heard something shift behind him. He spun around and without a thought, opened fire.